LOMIRA, Wis. – Dairy farmers have a long list of duties, including caring for their land, cattle and families. But, the responsibilities do not stop there for a group of dairymen who are part of the volunteer fire department in Knowles, Wis. The department has at least half a dozen active dairy farmers on its roster, including Mark Mueller, Bob Belling and his sons, Jason and Justin, Bob Christian, and Dan and Kyle Hesprich. All are from Lomira and live minutes from the fire department. As if these men do not work hard enough already, they still find time to fight fires and respond to other emergencies in their roles of volunteer firefighter and in some cases first responder. Mueller, who milks 300 cows and farms with his sons, has been on the department for 32 years and served as first assistant chief for 25 of those years. Bob Belling has been a volunteer firefighter with the Knowles Fire Department for 41 years and served as fire chief for 26 years. Milking 70 cows, he farms with his sons Jason and Justin, both of whom have followed in their dad’s footsteps and are also members of the department. Bob Christian, who runs a 1,500-cow dairy with his dad and brothers, has been with the department for 13 years, and, like the others, he takes pride in serving his community. Fitting firefighting into an already jam-packed schedule may seem overly ambitious, but these humble heroes do whatever it takes to get the job done. “You find a way to make it work,” said Jason Belling, a 17-year member of the department. Jason Kuehl is the department’s fire chief. He took over for Bob Belling eight years ago and has spent a total of 21 years on the department. Kuehl and Bob Belling are also first responders with the Brownsville Emergency Medical Service. Kuehl works at the implement dealer next door to the fire station. Although not a farmer himself, Kuehl has been involved with agriculture his entire life. The department sits in the middle of farm country, and its rural location lures a unique set of individuals to serve on its ranks – active dairy farmers, retired dairy farmers, those who grew up on farms, mechanics for various ag dealerships and so on. While the number of farmers on the department has shrunk over the years, the department’s connection to the industry is still strong. Even today, nearly all of the department’s 25 active guys have direct ties to agriculture. This farm-oriented fire department is unique. 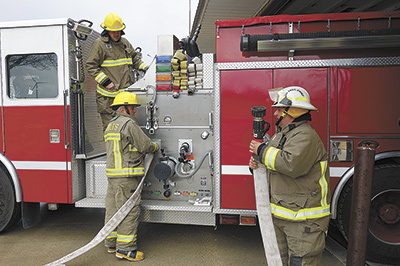 Well-versed in farm rescue training, silo fires and other farm-related emergencies, the Knowles Fire Department frequently helps other departments in the state when these types of crises arise. Knowles is an unincorporated village in the town of Lomira, and the department, which is privately owned, serves portions of the towns of Leroy and Lomira, providing one-third coverage to each. The department responds to fires of all kinds – from those occurring in barns to homes to businesses. They also respond to other types of emergencies and are one of the first on the scenes of accidents and disasters – including car crashes, damaging storms and other catastrophes. Rescuing people and animals from hazardous situations and providing basic medical attention are key aspects of the volunteer firefighter’s job description. The department averages 50-75 calls per year and has had 19 calls so far this year. Bob Belling has been on 40 calls already in 2019, most of which have been first responder calls. The department holds training every Tuesday. The state requires each firefighter to attend 12 training sessions per year, usually once a month. At the Knowles Fire Department, this schedule is adjusted to accommodate farming seasons. Therefore, farmers on the department might complete 7-8 trainings in the winter and fewer in the spring and summer months. Firefighters must be state-certified before entering a fire, which requires 96 hours of training. “The camaraderie is what I enjoy most about being a firefighter,” Christian said. “Building memories with our neighbors and other guys on the department is one of the things I like most about this job,” Mueller said. Bob Belling has enjoyed the experience. Serving on the Knowles Fire Department is a family tradition passed down through the generations, where brothers serve alongside brothers and fathers serve alongside sons. Nearly all of the firefighters have family members who have served on the department at one point or another. The longevity of the firefighters at this particular department is much higher than the norm. The national average for a volunteer is four years Kuehl said. Knowles has 14 men with more than 20 years of service, and about six men have been there for 10 years. With a population of approximately 900 people, Kuehl said Lomira does not have the tax base to support a full-time department. “The cost to the taxpayer would be phenomenal if we had to hire firefighters,” Kuehl said. Willing to take on much more than the average person, these brave dairy farming firemen donating their time to the fire department perform selfless acts of courage whenever they are called upon. Who better to tackle the demands of firefighting than guys familiar with dangerous, hard work and comfortable responding at the drop of a hat in any and all elements? Happy to help others, a farmer might be the ideal firefighter. “We’re lucky to have the farmers on our department,” Kuehl said.